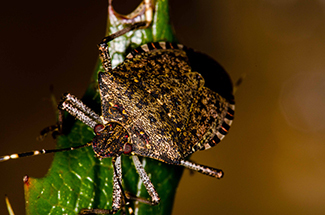 Impact: The brown marmorated stink bug (BMSB), Halyomorpha halys, is an invasive insect that damages fruit, vegetable and ornamental crops in North America. Where BMSB becomes established, it causes severe crop and garden loses and becomes a nuisance to people when the brown marmorated stink bugs move indoors through cracks and openings to overwinter. Brown marmorated stink bug was accidentally imported to the North America in the late 1990s. BMSB has since become well established in the mid-Atlantic States, in addition to Los Angeles, California and Portland, Oregon. This species moves rapidly to new locations by hitchhiking on vehicles and planes. The brown marmorated stink bug has been detected in the State of Texas. If you have spotted Halyomorpha halys (Brown marmorated stink bug), use this report form to send an email to the appropriate authorities.